This 16 oz. 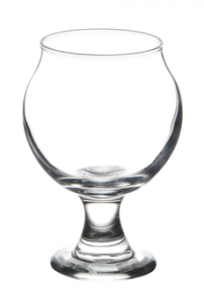 Toscana model beer glass will look great on your bar with an amber ale and a heady foam on top. They come 12 per case and hold 16 ounces for a classic pour. Go one step further and get every beer glass imprinted, etched or engraved with your business' logo. Need help designing a logo? Call Deja Brew and speak with a branding expert today.